Aintnobuffalo and I agreed to do a private winter themed custom swap as there weren't enough participants for the official Holiday swap. This was my first time using a new style G4 bait (Fluttershy). I loved this fun pose, I'd had the bait as a backup for some time and it gave me these "dashing through the snow" vibes. I couldn't resist trying out a flowy sculpted mane - I mean, those G4 rumps are tiny and I wanted to try something that would give me more room for painting. I love how it turned out! 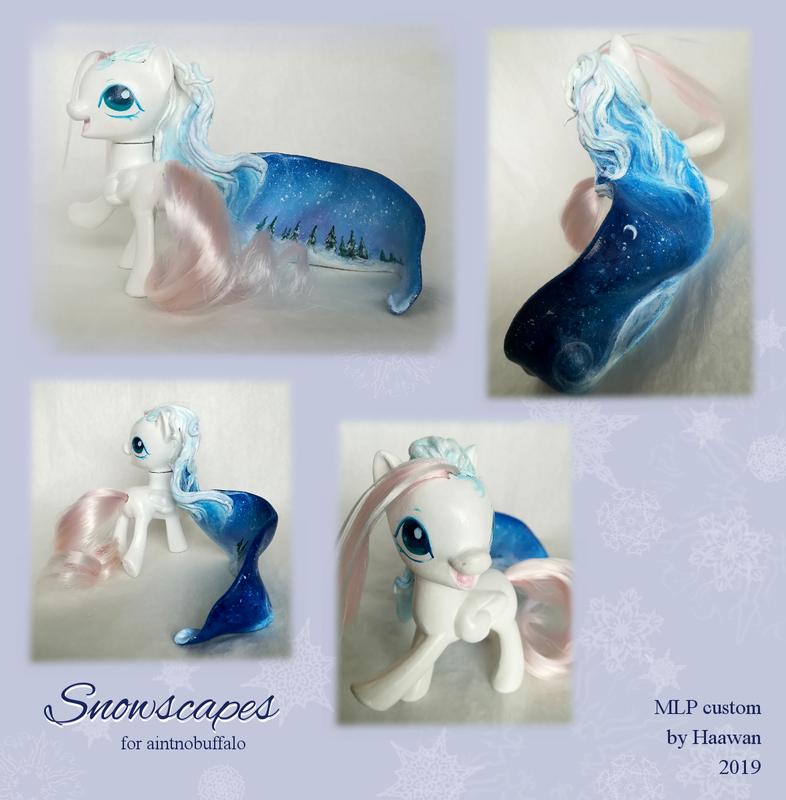 The hair was sculpted with Apoxie Sculpt and the pony was given a full body repaint in acrylics, sealed with matte polyurethane varnish. Tail and forelock are nylon hair from Dollyhair (Virgin Snow, Arctic Frost, Pussycat, possibly some other colous too ). The head still turns and she is pretty fun to pose. Thanks for a wonderful swap, ANB! Thank you, Roogna and MB! Avatar customs by NoDivision, puush & emuel. Sig by SDS. I love her! It definitely is a cute pose and dashing through the snow is perfect for it! Flip her around and she's pointing to a magical portal. Love that this one is so posable!